Product prices and availability are accurate as of 2019-04-13 14:24:58 EDT and are subject to change. Any price and availability information displayed on http://www.amazon.com/ at the time of purchase will apply to the purchase of this product. 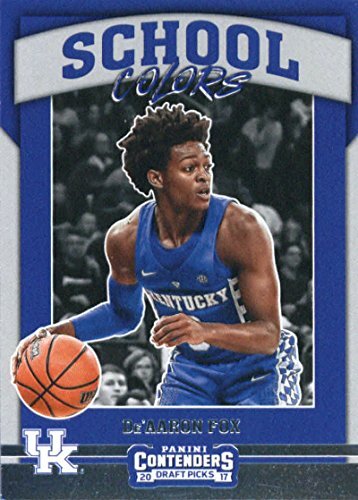 2017-18 Panini Contenders Drafts Picks School Colors Basketball Card. Collect the entire set and look for inserts here. Single Card Ships in Top Load and Soft Sleeve. Card Condition is NM-MT. We have team sets for Baseball, Football, Basketball, Hockey, and Soccer. We have a large selection of Autographs, Jerseys, and Memorabilia cards!